We have been working with Care Opinion to develop the accessibility of their site for people with dementia through picture supported stories.We are very grateful to Life Changes Trust for funding this partnership. What is Care opinion ? Why is our partnership important? Care Opinion is skilled and experienced in supporting feedback through their web platform and supporting health and care improvements through responding to and sharing that information . 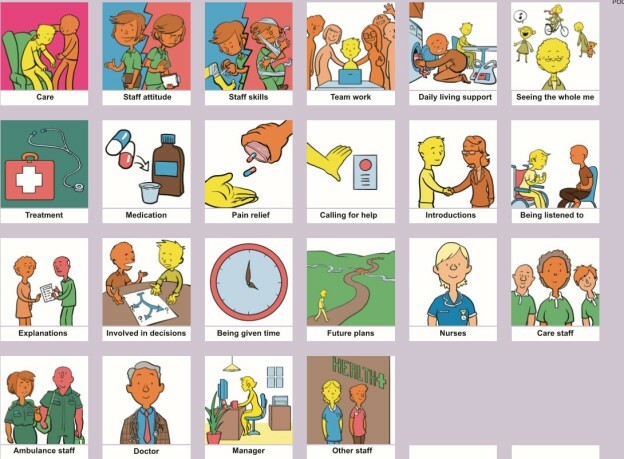 Talking Mats is skilled and experienced at supporting people with communication difficulties including people with dementia, to express their views. Partnership working between the two organisations has enabled a fusion of ideas and learning from each other to develop and action our vision of a care opinion platform that is more accessible and relevant to more people. This is particularly important when Alzheimer’s report ‘Fix Dementia Care: Hospitals’ reports that at least 25% of hospital beds are occupied by someone with dementia ,that they stay twice as long as other people over 65 and the experience of being in hospital is recognised as being a particularly frightening and confusing time. Who can use this and what support will they need? We know people with dementia have a very diverse range of needs and that people will require different levels of support to give their feedback on the care opinion site ranging from technical support, scribing, to reducing number of pictures, to pre-preparation using paper pictures. Some people with later stage dementia may find it hard to use it to give their own feedback but hopefully, the pictures will mean that they will still be involved and understand some of the things being talked about if people are submitting feedback on their behalf. We felt important that that the picture story space is an inclusive feature available to all to use if they want to. Whilst this feature was designed for people with dementia we have already had feedback that other people are finding it helpful. Several people have asked us if this is a Talking Mat and our response is that it is inspired by our work but it is different and for that reason we call it a ‘picture supported story’ .It is different partly, for technical reasons but also because the contexts in which people choose to give feedback will be varied e.g. some will do it by themselves, some supported by family and friends. Above all we want this to be freely available and recognise that that means people will use it in a variety of different ways some of which will surprise us! We are still developing support materials and webinars to go along with the site to help people get the most from it. However, there will be some people particular those with more severe communication difficulties who will need increased support to access the story space. Effectiveness for this group will improve if there is some preparation work to prepare their feedback .Using the paper set combined with the principles of Talking Mats to support communication will help. It is for this type of support we recommend attending a Talking Mats foundation training so people are confident and skilled using the pictures in a Talking Mats framework. For the last month the picture story feature has been available on the site and we are starting to get a range of stories on it. I particularly like the one that was submitted by a school pupil on work experience supporting a person with dementia to share his experience of going to an inter-generational quiz at the local nursery which had been a very positive experience for all involved. This entry was posted in Communication difficulties, Dementia, Personalisation and tagged accessible information, Dementia, Feedback on October 30, 2017 by Lois Cameron.